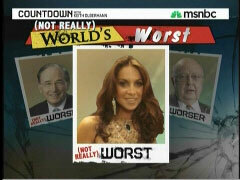 On Wednesday's Countdown show, Keith Olbermann featured a "Worst Person" segment for the first time since indefinitely suspending it a few weeks ago as the MSNBC host decided to go after Pamela Geller, whom he called a "buffoon"; Democratic Senator Jay Rockefeller, who committed the sin of lumping MSNBC in with FNC while criticizing cable news; and frequent target FNC's Roger Ailes. In awarding the first place dishonor to Geller, he linked her opposition to the Ground Zero Mosque the bombing of a mosque in Jacksonville, Florida. Olbermann: "But our winner, Pam Geller. If anybody committed the original sin of stirring up the blind, stupid anger that is religious hatred in this country, it's this buffoon." He soon added: "Well, there is a problem with the two minutes hate:You may lose control of it, and it may come back to attack you. It spread from a proposed Islamic center in New York to an actual mosque bombing in Jacksonville to protests in Tennessee to this moronic anti-Sharia law law in Oklahoma and now Phoenix." The Countdown host went on to blame Geller for people complaining about a Christian church being built in the Arizona city which some have mistaken for a mosque because of its shape. As he awarded the third place dishonor to Rockefeller for criticizing MSNBC, Olbermann noted that "Senator Rockefeller has repeatedly volunteered to me that he is a devoted viewer of this program." And when he attacked FNC's Ailes over a Fox Nation headline charging that President "Obama Praises Indian Chief Who Killed U.S. General," the MSNBC host mocked Ailes and FNC as supporters of General George Custer, and asserted that part of Ailes's "befuddled past" was being "obsessed with damaging NBC after they fired him" - which is ironic since the MSNBC host frequently targets Fox, his former employer. KEITH OLBERMANN: First, get out your pitch forks and torches, time for the new and improved not really Worst Persons in the World, with a new nicer version of the music. The not really bronze goes to Senator Jay Rockefeller of West Virginia. A hearing today on TV Re: transmission consent. He says TV is ailing and there is, quote, "endless barking" on cable news. He adds, "There's a little bug inside of me which wants to get the FCC to say to Fox and to MSNBC, 'Out. Off. End. Goodbye.' It would be a big favor to political discourse; to our ability to do work here in Congress; and to the American people, to be able to talk with each other and have some faith in their government and, more importantly, in their future." Two things, Senator Rockefeller has repeatedly volunteered to me that he is a devoted viewer of this program. (WHISPERS) We're on MSNBC, Senator. (STOPS WHISPERING) And more importantly, the FCC - the Federal Communications Commission - does not have any control over the content of cable television. Mr. Rockefeller's on the Senate Committee on Commerce which has oversight on communications, so you'd think he could ask somebody about that little detail. The not really, okay, we need the other music. Brian, thank you. The not really silver, Roger Ailes, as in "What ails this country?" The chairman of "Fixed News." He told an online gossip site today, quote, "The President has not been very successful..." Ailes added, "He had to be told by the French and the Germans that his socialism was too far left for them to deal with." Ailes added, "he just has a different belief system than most Americans." Given Mr. Ailes's befuddled past - pro-Nixon, obsessed with damaging NBC after they fired him - it is absolutely possible that Ailes thinks he is speaking of public opinion and not public opinion he helped to manufacture. One of Ailes's Fox News Web sites today attacked the President for his new children's book: "Obama Praises Indian Chief Who Defeated U.S. General." That's the cleaned up version. The original headline read: "Obama Praises Indian Chief Who Killed U.S. General." "His most controversial choice may be Sitting Bull, who defeated Custer at Little Bighorn: ('A Sioux medicine man who healed broken hearts and broken promises.')" Seriously, we've reached the point where Fox News is still rooting for General Custer at Little Bighorn. Have Ailes take Beck and Hannity and O'Reilly and go to the memorial in Montana and start chanting, "USA, USA!" But our winner, Pam Geller. If anybody committed the original sin of stirring up the blind, stupid anger that is religious hatred in this country, it's this buffoon. When even the Laura Ingrahams of this world thought the Park 51 Project in New York City was a great example of cultural outreach and healing, Geller insisted it was a "triumphant mosque." Well, there is a problem with the two minutes hate:You soon lose control of it, and it may come back to attack you. It spread from a proposed Islamic center in New York to an actual mosque bombing in Jacksonville to protests in Tennessee to this moronic anti-Sharia law law in Oklahoma and now Phoenix. As this structure is being finished, the new dome - visible from the I-10 highway there - is taking shape and people have been coming up to the builders, to the officials demanding to know who let them build the mosque with that funny name La Luz del Mundo. It's La Luz del Mundo, the light of the world. It's not a mosque, it's a multi-denominational church, a multi-denominational Christian church. Nice work, Ms. Geller. Now you've got Islamophobes protesting a church. Pam Geller, today's "Worst Person in the World," not really!